Mina Kim, center, hosts from left to right Anne Dubay, Chris Keys, Dayren Torres and Jeff Okrepkie on KQED Forum on the Road. The guests all lost their homes in the Oct. 8 fire. Photo by Abraham Fuentes. Chris Keys and his family lost stability for their five-year-old autistic son, all their possessions, as well as their Santa Rosa home in the October wildfires. Keys is now paying $3,500 for rent in addition to his mortgage for their destroyed home. 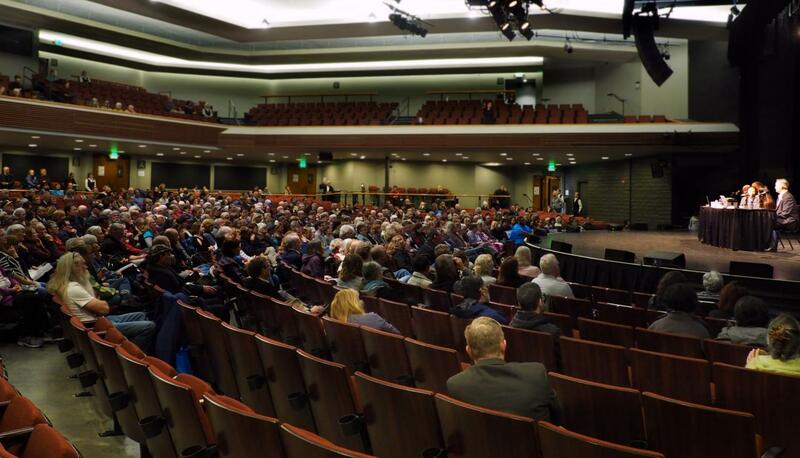 Six months after the devastating Oct. 8 fires that destroyed more than 5,000 homes in Sonoma County and killed 44 people, victims and officials discussed the long road to recovery this morning on the “KQED Forum on the Road” live broadcast at the Luther Burbank Center for the Arts in Santa Rosa. “PTSD is a very real thing. The vegetables don’t taste the same. Walking through the neighborhood and smelling fire from a wood burning stove is difficult for us,” Keys said. Beyond PTSD, the biggest hurdle former homeowners are facing is dealing with insurance. Victims are required to submit a detailed inventory of everything they lost in the fire. Navigating insurance is like a full-time job for many victims. “You have to argue what the meaning of ‘cost of replacement’ is. My understanding is replacement cost is ‘this’, but they say it’s ‘that’,” said Jeff Okrepkie, who was a renter in Coffey Park. Okrepkie and his wife are now renting an 1,100-square-foot apartment for $3,500 per month. 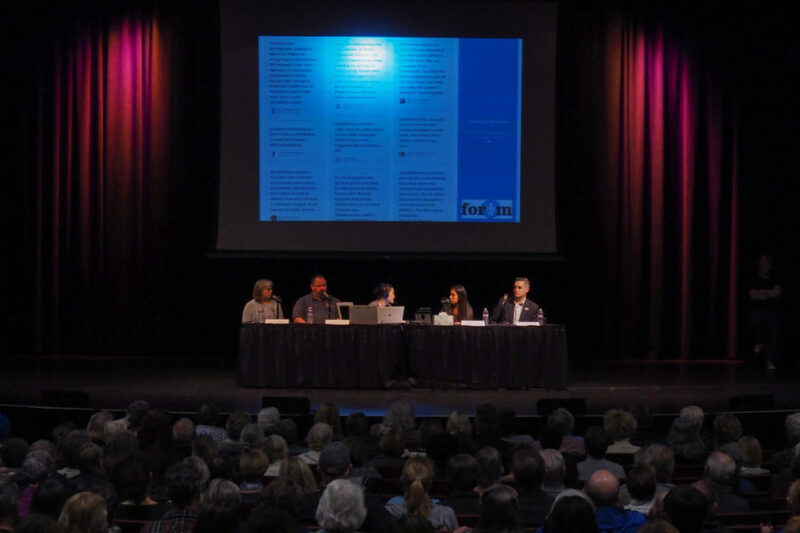 During a live broadcast of “Forum on the Road” victims who lost their homes shared how they are recovering six months after the Oct. 8 fires that destroyed more than 5,000 homes burned in Sonoma and Napa counties. Photo by Jennifer Do. Dayren Torres, a sophomore at Roseland University Prep in Santa Rosa, is sharing two FEMA provided RVs with her five person family. They did not have fire insurance. “The hardest part is probably draining out the poop,” Torres said to laughs in the crowd. The family can keep the FEMA RVs until April next year and they don’t know where they will go after that. Victims who lost their homes in the Oct. 8 fire speak on “KQED on the Road” about recovery and rebuilding six months later. Photo by Abraham Fuentes. 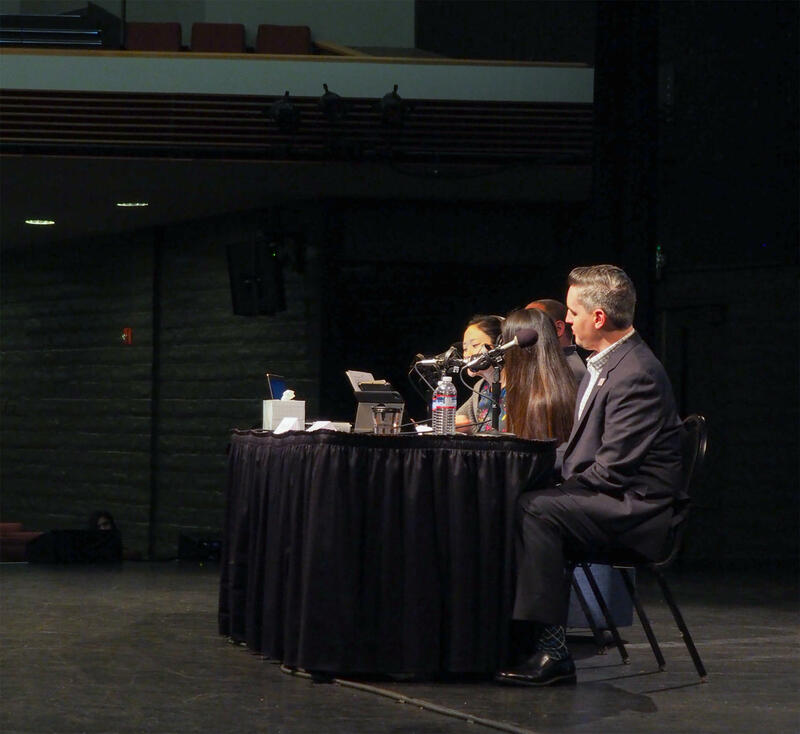 In the second hour, host Mina Kim welcomed city and county officials onto the forum. Santa Rosa Mayor Chris Coursey spoke about the most urgent problems facing fire victims. “Insurance is a critical problem for people because they haven’t settled with their companies. A lot of people are finding that they’re under-insured. The cost of construction is very high right now because the demand of construction is high,” Coursey said. There is also an emotional component. People who never had interest in building a home are now having to deal with that process in addition to replacing everything they owned. “The hill they are climbing is very steep,” Coursey said. Susan Gorin, first district supervisor of Sonoma County, shared details about the recovery process in more rural areas. “The rebuilding process is more complicated in unincorporated areas because they are served by wells and septic systems. The sheer shortage of technical experts that can help with soil testing is frustrating,” Gorin said. Gorin said it made her furious that insurance companies are requiring the inventory process. She said they should give 100 percent of the coverage victims are paying for. Jennifer Gray Thompson, executive director of Rebuild Northbay Foundation, called for the private sector to step up support alongside city and county relief services. Rebuild North bay Foundation’s main objectives are to improve the emergency response system, as well as coordinate resources for victims. Omar Medina, coordinator for UndocuFund, which provides direct assistance to undocumented victims of the fires, shared concerns from one of the most vulnerable sections of the community impacted by the fires. Medina said that undocumented community members lost wages because schools were closed during the fires and parents had to stay home from work to care for them. Those who worked as house cleaners lost jobs when homes burned. And of course many undocumented victims are wary of obtaining federal aid for fear of deportation. UndocuFund issued $3.7 million in grants so far, which Medina said is not nearly enough. “Our maximum grant is $3,000. It’s a one time grant that can only go so far. In the immediate moments there was a lot of help coming in, but I still see people coming in. They’re coming in now begging for help. I try to refer them to other non profits, but the aid is running out there too,” Medina said. Coursey, Thompson and Gorin all shared various updates about the rebuilding process. Permit costs are being lowered to create granny units on properties. 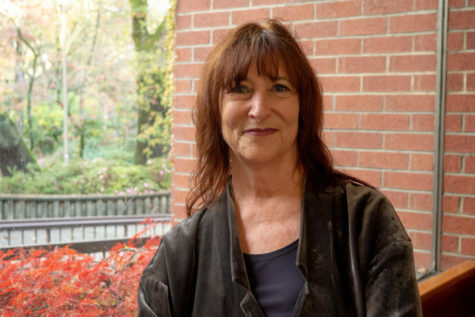 Options like tiny homes and accessory dwelling units (ADUs) are in negotiation. Coursey fielded a question about whether or not it was a good idea to rebuild in fire-prone areas. He assured listeners that the building projects in the works are for downtown areas close to public transportation. The city plans to build denser, higher housing.